Sally Ride forged her name in the field of space aeronautics and was a woman who achieved many firsts in NASA history. She was officially the first American woman who travelled to space. Sally Kristen Ride was born on May 26, 1951 in Encino California, the older of two daughters. Her father, Dale B. Ride, was a professor of political science in Santa Monica College while her mother, Carol Joyce Anderson Ride, was a volunteer counselor who worked at a women’s correctional facility. Both of her parents instilled in her the importance of exploring, which she credits as the foundation from which her passion for science was born. Sally was athletic in her early days, and obtained a partial tennis scholarship when she attended the Los Angeles prep school, Westlake High School for Girls. Before attending the prep school, she also attended Portola Junior High. Enjoying sports, she also participated in running, and played softball and volleyball. She had a brief professional tennis career. She attended three semesters in Swarthmore College and signed up for some physics courses in the University of California, Los Angeles (UCLA) before finally going to Stanford University as a junior where she earned two degrees in 1973: a Bachelor of Science degree in Physics and a Bachelor of Arts degree in English. Still keeping her passionate for science, she earned her Master of Science degree and her Doctorate in Physics, also in Stanford. Within this period, she was actively doing research on the interaction of x-rays and an interstellar medium. She had a brief marriage with Steven Hawley, a fellow astronaut, from 1982 to 1987. The marriage did not bear them any children. Sally Ride immediately pursued her dream when she saw an ad in the Stanford student newspaper about the National Aeronautics and Space Administration’s (NASA) invitation for qualified students to join their astronaut program in 1977. She applied for a spot after earning her degrees in Stanford. She began spaceflight training in 1978 and was one of the first six female astronauts selected by NASA among 8,000 other hopefuls. She began as a capsule communicator, part of the team’s ground support, for the second and third shuttle flights in 1981 and 1982. She finally experienced space travel when she was 32 years old. She was part of NASA’s 7th shuttle mission and was the mission specialist on the Space Shuttle “Challenger”. They launched on June 18, 1983 and returned to Earth in June 24. She was the first ever woman who operated the shuttle’s robotic arm as part of the team’s mission to launch communication satellites. A trip of many firsts, this was the first successful deployment and retrieval of satellites while using the shuttle’s robotic arm. Before the actual flight, she caught the attention of the media because of her gender. There were questions about how the flight would affect her reproductive organs, and there were some who asked if her emotions as a woman could affect the way she did her job. But Sally stood firm, saying that she saw herself only as an astronaut. In October 5, 1984, Sally made history once again by being the first American woman to return to space. A nine-day mission on the Space Shuttle “Challenger”, she was once again in charge of operating the robotic arm. She readjusted the radar antenna and removed ice from outside the shuttle. Her training for her third Challenger mission was cut short because of the January 1986 Challenger disaster. Seven crew members died on that day as the shuttle suddenly broke apart a mere 73 seconds after take-off. The shuttle program became inactive for 32 months after the event. All in all, she spent over 343 hours in space. Because of her historical experiences in space aeronautics, Sally continued to work for NASA and was part of the Rogers Commission—a team set up by then president Ronald Reagan that investigated the Challenger disaster. She was part of the accident investigation board that worked on the Columbia shuttle tragedy in 2003 which had disintegrated upon reentering Earth’s atmosphere, killing all seven crew members. Her knowledge also led her to become part of the committee that defined NASA’s spaceflight goals in 2009. Sally left NASA in 1987, but never neglected her passion for space and science. She returned to Stanford as part of the university’s Center for International Security and Arms Control and moved to the University of California in San Diego as a professor of physics in 1989. She also served as the director for the California Space Institute. She was SPACE.com’s president from 1999 to 2000. In 2001, a science outreach company called Sally Ride Science was born. She founded the organization to support her vision of encouraging girls and young women to explore and pursue their passion for science the same way she did. Part of their many programs was a MoonKam experiment that allowed students to take photos of the moon. She was the company’s President and Chief Executive Officer, while a childhood friend and partner for 27 years, Tam O’ Shaughnessy, served as co-founder, Chief Operating Officer, and Executive Vice President. Further proofs of her drive to pull children into the world of science are the five children’s books she wrote about science. She published “To Space and Back” in 1986, “Voyager” in 1992, “The Mystery of Mars” in 1999, “Exploring Our Solar System” in 2003 and “The Third Planet” in 2004. She was recognized time and again for her numerous contributions to space aeronautics and her unending passion for space and science. She became part of the Astronaut Hall of Fame in 2003. 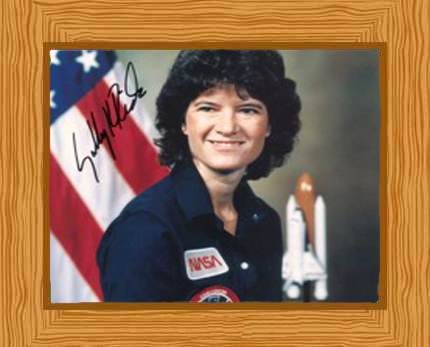 Sally Ride fought against pancreatic cancer for 17 months and died at the age of 61 on July 23, 2012. Her remains were cremated and placed at Woodlawn Cemetery in Santa Monica, California next to her father.